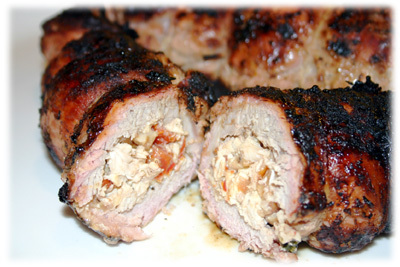 Inspiration for this stuffed grilled pork tenderloin recipe came about when I had some extra grilled chicken bruschetta on hand. 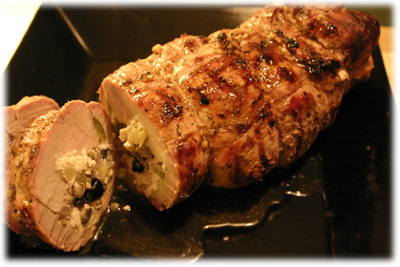 Not wanting to waste good food and always on the look-out for another easy pork tenderloin recipe for tasteofBBQ I decided I'd give it a try. You don't have to wait until you've extra bruschetta on hand, just make a smaller batch of the recipe and stuff the tenderloin with that. What also makes this pork recipe a bit more interesting is it's almost an inside-out version of this California barbecue chicken recipe where the chicken's on the outside and pork is on the inside. This is a great main BBQ dish for any occasion and requires little preparation time and no marination time. 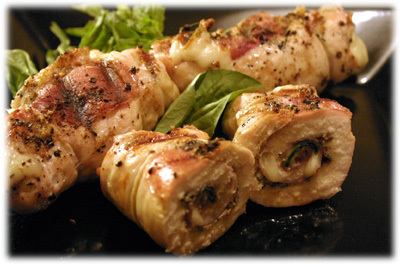 Prepare the grilled chicken bruschetta recipe according to directions found here. 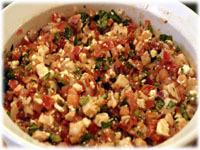 Mix the ingredients of the grilled chicken bruschetta in a large glass bowl, cover and set aside. 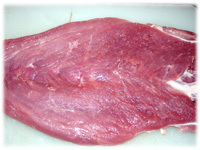 Butterfly the tenderloin by slicing them lengthwise 3/4 of the way through. Don't slice the tenderloin completely in half or it makes it difficult to keep the stuffing in while cooking. 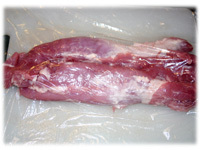 Place a sheet of plastic wrap over the butterflied pork tenderloin and gently pound the meat with a meat hammer until it's an even 1/2" thick. Place 12" lengths of string about 1 1/2" apart on your working surface. Place one of the butterflied pork tenderloins directly over the string. Place 1 cup of the bruschetta recipe on the tenderloin about a 1/2" from each edge. 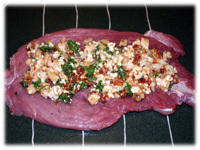 Bring the long edges of the tenderloin together so the stuffing is completely enclosed. 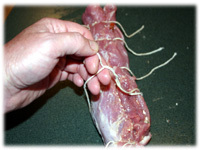 Tie each piece of string together tightly so the stuffing won't fall out while cooking. Set up the grill for direct heat and preheat to 500F - 525F. 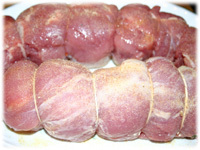 Rub 1 tablespoon of garlic powder of the entire surface of each tied, stuffed pork tenderloin. 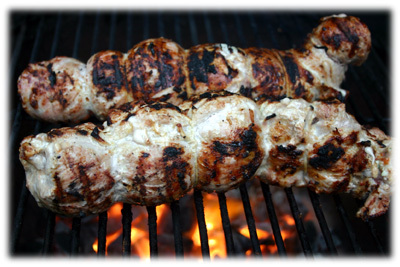 When the barbecue has reached cooking temperature place the tenderloins on the grates and close the lid. 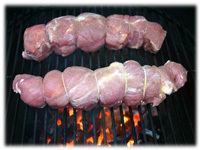 Every 5 minutes roll the pork tenderloins a 1/4 turn on the grates so each side is evenly cooked. After 20 minutes the internal temperature of the pork (don't insert the probe into the stuffing) should read at least 145F - 150F. After you remove the grilled pork tenderloins cover them with aluminum foil and let stand 5 minutes.